The West African country of Liberia ranks as one of the lowest in the world in most measures of health. The diagnosis and management of complex surgical cases such as aortic dissection is extremely challenging, for reasons ranging from lack of diagnostic imaging capabilities to the high resources required for definitive surgical intervention. We present the first known successfully managed case of aortic dissection in the country’s history and with it highlight the challenges faced and a number of lessons learned that are beneficial to anyone working in resource-limited environments. A middle-aged Liberian mechanic presented to JFK hospital, Liberia’s main teaching hospital and referral centre, with a chief complaint of severe chest pain and palpitations for 2 weeks’ duration. The pain was described as dull and progressively worsening, until the morning of admission where he described 8/10 crushing chest pain radiating to the neck and jaw, partially relieved by morphine in the emergency department. Associated features included diaphoresis, vomiting and agitation. There was no history of chest trauma, connective tissue disease, hypertension, diabetes or dyslipidaemia. He had no other known medical conditions, and he was not taking any medications at the time of admission. There was no history of illicit drug use, and he had a remote 10 pack-year smoking history, quitting 22 years ago. On examination, he was diaphoretic, and in severe distress secondary to pain. Vital signs included a blood pressure (BP) of 130/86 mm Hg, heart rate of 116 beats per minute, respiratory rate of 22 breaths per minute and a temperature of 36.5°C with a body mass index of 30.4 kg/m2. No oxygen saturation was documented. His cardiovascular exam was unremarkable with no murmur, radial-radial delay or significant BP differential on each arm; the only pertinent finding on the rest of his examination was epigastric tenderness. Supported by an ECG showing an anteroseptal ST elevation myocardial infarction (figure 1), the initial impression was acute coronary syndrome (ACS). Cardiac enzymes and D-dimer are not readily available at JFK. Percutaneous coronary intervention or thrombolysis were also not available; he was managed with morphine, oxygen, nitrates and aspirin; however, the pain continued to progress. The managing team suspected an aortic dissection, so a chest X-ray (CXR) was performed, which showed mediastinal widening (figure 2), prompting a point-of-care ultrasound. 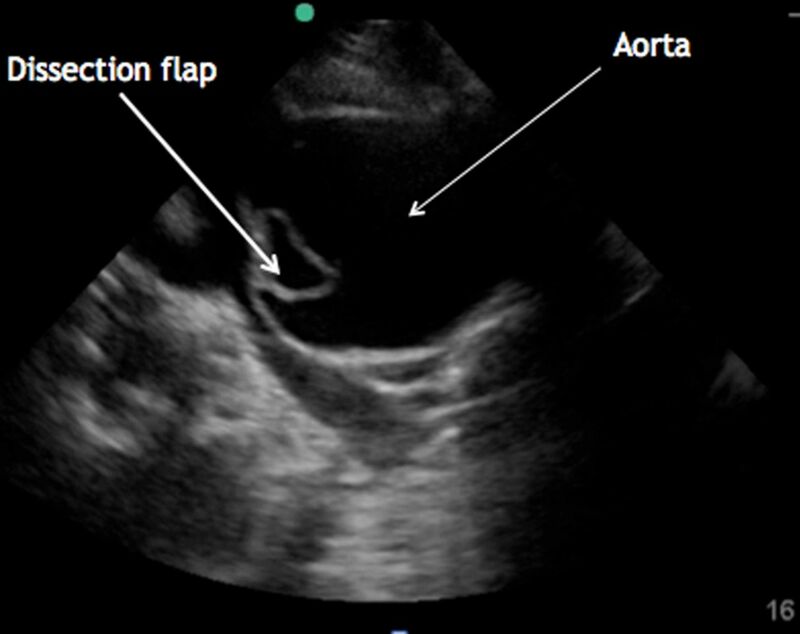 This showed a dilated aortic root >4 cm (5.48 cm) (figure 3) with visible dissection flap at the aortic root (figure 4). 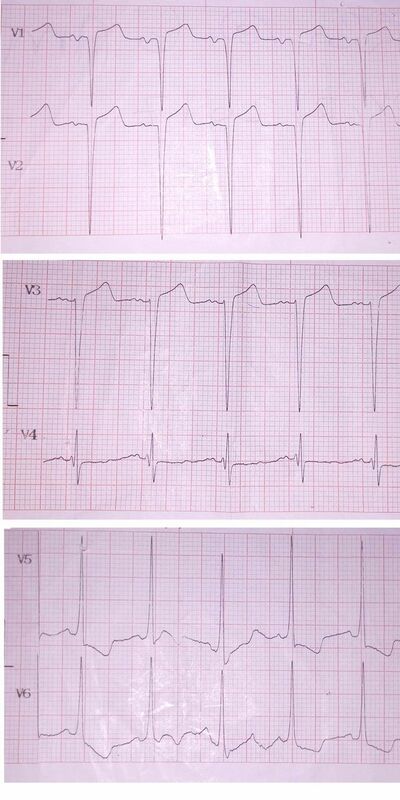 Patient’s ECG showing precordial leads only, with ST elevation in V2 and V3 and ST depression in V5 and V6. 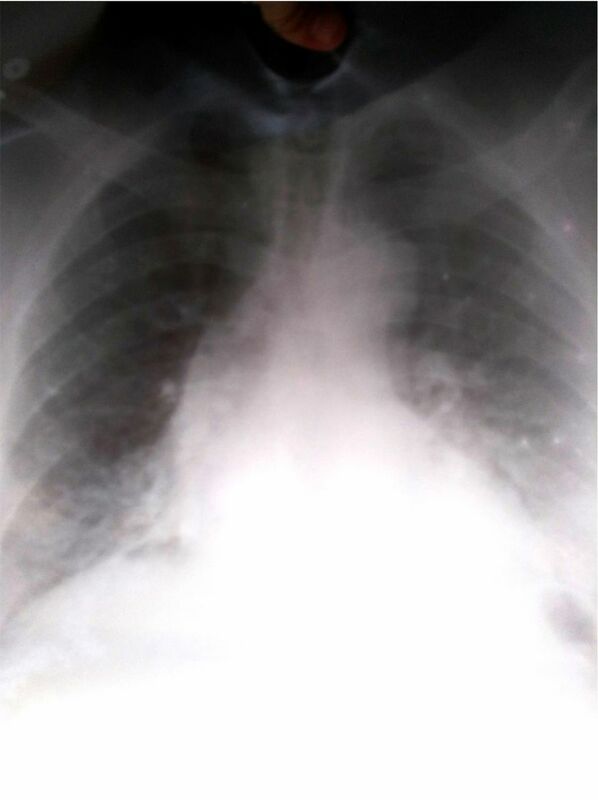 Patient’s chest X-ray showing a widened mediastinum. 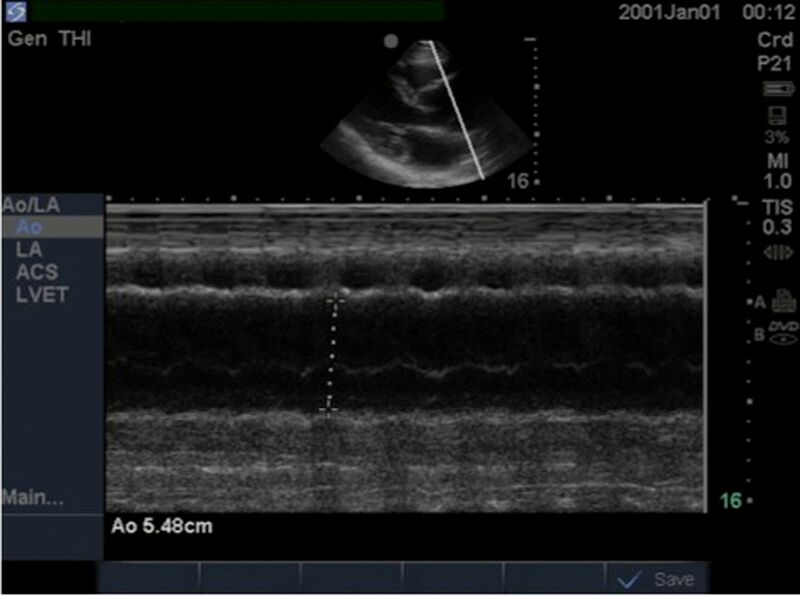 Transthoracic ECHO in M mode showing aortic root measurement of 5.48 cm. Transhoracic ECHO parasternal long axis view showing dilated aortic root with visible dissection flap. A diagnosis of type A aortic dissection was made. Given the very high mortality associated with conservative management, the patient was informed about the necessity of urgent surgical repair. He did not have health insurance; medical evacuation by air ambulance was prohibitively expensive. After a few days of negotiating, he managed to secure a loan from his employer and was assisted in making arrangements for travel to Ghana. Medically optimised, his BP and pain were adequately controlled on oral agents, and he travelled on a standard commercial flight to Accra, where he underwent successful operative repair with an inclusion graft replacement of his ascending aorta (figure 5). The operative findings included ‘extensive intimal flap with primary tear at the sinus tabular junction involving the left coronary ostium’, which likely explains the ischaemic changes seen on his ECG. Photo of patient with healed sternotomy scar. The patient has since returned to Liberia, is living with his family and is back at work. He is still paying off his loan. To the best of the author’s knowledge, this is the first time that a Liberian national with a type A aortic dissection has been diagnosed in Liberia and successfully treated. Aortic dissection is a notoriously difficult condition to diagnose clinically, with high rates of reported misdiagnosis, even in advanced healthcare systems. This problem is likely exacerbated in low-income countries like Liberia, due to lack of awareness among clinicians about rarely seen or diagnosed conditions. The definitive diagnosis of aortic dissection is also extremely challenging in Liberia; the gold standard of diagnosis is a CT angiogram, which is not available in the capital Monrovia. Ultrasound can be used to make the diagnosis; however, only a very small number of clinicians in Liberia have sufficient expertise to use ultrasound to diagnose aortic dissection. Due to a lack of persistently present trained anaesthetists and cardiothoracic surgeons in Monrovia, the lack of suitably equipped operating theatres and the significant limitations of the available intensive care units (ICUs) in the country, there is currently no permanent capacity for definitive operative repair of such cardiothoracic cases in Liberia. Healthcare utilisation remains very low, and there are often insurmountable financial, logistical and medical barriers to receiving lifesaving interventions in other countries. The ability to travel outside of Liberia for medical care is reserved to a tiny fraction of the population, which highlights the huge disparity in health outcomes related to inequity of socioeconomic status. There tends to be pessimistic perceptions among doctors of likely health outcomes for patients presenting with conditions that cannot be adequately treated in the country. Aortic dissection is a life-threatening emergency characterised by tearing of the inner layers of the aorta, creating an intimal flap that separates the true and false lumens.1 There are several classification systems used; the most widely used is the Stanford system in which dissections are classified as either type A (involving the ascending aorta) or type B (occurring distal to the left subclavian artery).2 Aortic dissections are associated with significant mortality, even in high-income countries with advanced medical systems. The International Registry of Acute Aortic Dissection reports an overall in-hospital mortality rate of 27.4% and a mortality of 58% in patients with a type A aortic dissection not receiving surgery.3 Other series have reported untreated mortality rates of 50% within 24 hours and 68% within a week.1 Liberia ranks amogst the lowest countries in the world in most measures of health,4 and there is no published data reporting aortic dissection prevalence or mortality rates in Liberia. Given the non-specific signs and symptoms of aortic dissection, a high index of suspicion is essential to detect the disease before life-threatening and irreversible complications occur.7 A clinician is unlikely to make the diagnosis of acute aortic dissection unless considered in the differential diagnosis, and clinicians are less likely to consider diseases that they rarely encounter. The incidence of acute aortic dissection in the western world has been estimated at 5–30 per million per year.8 While the incidence of aortic dissection in Liberia is unknown, it is fair to assume that it is similarly rare; anecdotally, this was the first case of aortic dissection encountered by most of the Liberian internal medicine residents. One study of all patients admitted to a Nigerian teaching hospital found only 10 cases on non-traumatic central arterial aneurysms in a 9-year period.9 Whether this represents the true incidence or is a reflection of underdiagnosis is impossible to say. Since clinical examination alone, including obtaining bilateral upper extremity BPs, has been found to be insufficiently sensitive to rule out acute aortic dissection,10 clinicians rely heavily on further diagnostic tests. Initial investigations that are often performed for any patient presenting with acute chest pain are an ECG and a CXR. While these may provide diagnostic clues, neither is sufficiently sensitive or specific to confirm the diagnosis.11 The most frequently observed ECG changes are non-specific and are normal in 31% of patients. Furthermore, ischaemic ECG changes caused by the aortic dissection can be wrongly interpreted as representing a myocardial infarction (as in this case), which has significant implications as discussed above. Similarly, the classical CXR finding of a widened mediastinum are absent in 37% of patients10; therefore, a normal CXR does not exclude dissection. The three main imaging modalities used for definitive diagnosis of aortic dissection are CT angiogram, MRI scan and transoesophageal ECHO.12 There is no MRI scanner in Liberia, neither is there currently capacity for transoesophageal ECHO. There is only one CT scanner in the country located in a regional town over 4-hour drive from JFK Hospital (significantly longer in rainy season), making it very challenging to refer critically ill patients for a CT scan. POCUS resident training in Liberia is the first of its kind. Through the World Bank-funded Workforce Health Programme in Liberia, Boston Children’s Hospital supported a dedicated programme to train an interdepartmental cohort of selected residents during the academic year from July 2017 to June 2018. With both a pre-existing foundation of ultrasound knowledge planted by previous short-term educators and equipped with the hardware of available and departmental ultrasound machines, the Liberian postgraduate training programme was ripe for a comprehensive POCUS educational programme. Twelve interdisciplinary residents from internal medicine (3), family medicine (3), paediatrics (2), obstetrician-gynaecologist (2) and surgery (2) were officially in the training programme, longitudinally throughout the year. Complete with a quality assurance programme for feedback and review of completed ultrasounds performed, the evaluation of the aorta, including the pathology of dissection, abdominal aortic aneurysm and periaortic lymph nodes, were covered in the year’s curriculum. Although JFK is Liberia’s premiere teaching and referral hospital, it has significant challenges. When it opened in the 1970s, JFK was one of the best equipped hospitals on the continent. However, two civil wars, stretching almost uninterrupted from 1989 to 2003, left the country’s economy, education and healthcare system in ruins. Finally on the road to recovery, it was further hampered by the Ebola outbreak of 2014–2015, which had a devastating effect on the population of physicians and on the economy, leading to the closure of JFK and the suspension of normal medical education. At the present time, there is no permanent capacity for cardiothoracic surgery in Liberia due to the lack of permanently present cardiothoracic surgeons and anaesthetists, the lack of a suitably equipped operating theatre and the significant limitations of the available ICUs. Even in more advanced healthcare systems in the region where the operative capacity does exist, authors have identified several problems including non-availability of on pump expertise and prosthesis, late presentation of patients, under utilisation of CT and or MRI, poor compliance to antihypertensive drugs and poor follow-up.15 The situation is, however, improving; 15 years of uninterrupted peace, the first democratic and peaceful transition of power since before the war and significant foreign aid investment are all contributing to the development of Liberia’s healthcare system. The Liberia College of Physicians and Surgeons (LCPS) was inaugurated in October 2013 as the first postgraduate medical training institution in Liberia with the core faculties: internal medicine, surgery, paediatrics, and obstetrics and gynaecology. The LCPS faculty recruitment programme started in 2015 post-Ebola as part of the Liberian health system strengthening programme in order to build a resilient health force that can withstand threats of emerging and re-emerging diseases. The 2014 and 2015 Ebola outbreak forced a halt in the training, but many of the residents were involved in working and training other health workers in the fight against Ebola. In 2017, the first batch of medical specialists graduated after an exit exam with external examiners from the West African College of Physicians. LCPS faculty recruitment programme has had 25 faculty members in the core faculties over the years. At the time of writing, there have been four successful membership candidates in West African College of Physicians examinations; three in internal medicine and one in paediatrics. Family medicine was added as a faculty to LCPS in 2017. There are plans to add ophthalmology in 2018. Other faculties earmarked for 2018 are community medicine and anaesthetics. With the expected completion of the modern imaging centre at JFKMC later this year, radiology postgraduate training may be a possibility in 2–3 years. The economic cost of healthcare is particularly pertinent in the case of advanced surgery that can only be obtained abroad. As it stands, any patient requiring cardiothoracic surgery has the choice of either conservative management or travelling to a nearby country that has the capacity, such as Ghana or Senegal. This is only possible for a tiny fraction of Liberian’s population. The only country with cardiothoracic surgery accessible by road (within a reasonable time frame) is Cote D’Ivoire, and this requires a 2-day drive to the border on a dirt road, which is impassable in rainy season. Transfer by aeroplane is the only realistic option; however, evacuation by air ambulance can cost tens of thousands of US dollars (USD), and even the cheapest option of a standard commercial flight (as this patient opted for) costs several hundred USD. The most recent World Bank figures (2016) report Liberia as the fifth poorest country in the world, with a Gross National Income (GNI) of only $370. 38.6 percent of Liberians live on less than $1.90 a day.18 Private medical insurance and air travel are therefore prohibitively expensive for the majority of the population. In addition to the financial barriers to receiving care outside of Liberia, there are significant medical and logistical difficulties. With the exception of a private air ambulance, all forms of transport outside the country require the patient to travel independently on public transport. This is obviously not possible for unstable patients; many patients with aortic dissection have very high BPs that require frequent doses of intravenous antihypertensive agents to control, and it is not possible to administer them or suitably monitor the patient on a commercial flight. Despite the fact that the patient in this case was relatively stable, there were still many barriers in getting permission from airlines for a person with a known life-threatening medical condition to travel; the commercial airline requires a detailed medical report and a licenced medical doctor to accompany the patient on the aircraft. In addition, they require the appropriate arrangements in place in the destination country with an ambulance service to transport patients to the referral hospital on arrival. 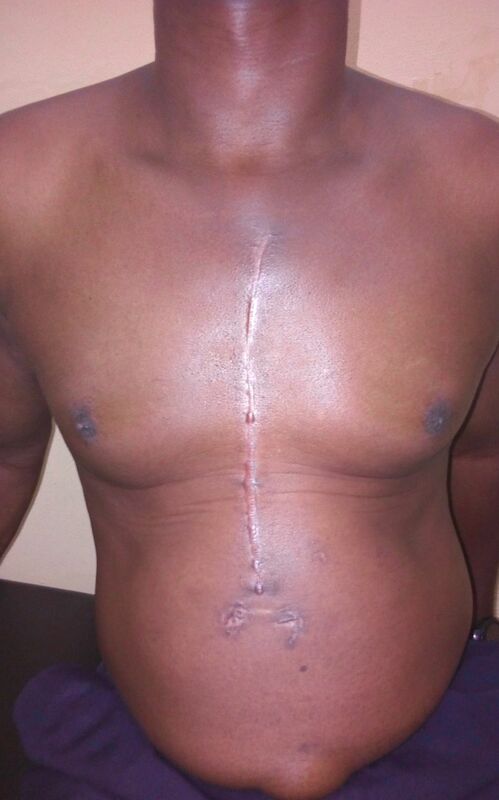 Given the enormous technical and financial barriers to care for patients requiring specialised surgical treatment outside of Liberia, it is understandable that many doctors working in Liberia have pessimistic perceptions about the likely outcome for patients like these; despite the advances in healthcare in Liberia, for the vast majority of Liberians suffering from an aortic dissection, it will still be a fatal event. Everything went as well as possible for this patient: he sought medical care in Liberia’s top facility promptly, he was seen by some of the very few doctors in the country capable of diagnosing aortic dissection, he was able to secure a loan to pay for his air travel, his BP and pain were well controlled with oral agents alone allowing him to safely fly, the airline agreed to transport him and the operation went well. A break in any point of the chain would have lead to a very different outcome for him. No matter how difficult the task might seem or how improbable a good outcome, all patients should be advised of the various options open to them, including ideal management despite the setting. If they have the means to pursue it, every effort should be made to support them, because improbable does not mean impossible. When I first experienced the chest pain, I was just at home, and I tried first aid like pain tablets, but that didn’t work. So I went to SOS clinic and I was diagnosed with heart failure, and that’s how they recommended I came to JFK, which I did the very same day. When I was told I had an aortic dissection I didn’t know what that was. I was very worried whether I would survive this particular sickness I had, because anything to do with the heart is very worrisome. When I was told I would have to go abroad for treatment I spoke to my employer, and they agreed to give me a loan, which I’m still paying back. Without that I wouldn’t have made it. Everything went very smoothly when I arrived in Ghana, I was picked up in an ambulance at the airport and taken straight to the hospital; all the senior cardiologists saw me; I had a CT scan straight away then was sent upstairs to the ICU, and two days later I had the operation. I’m just thankful it went this way, and I was able to have the surgery. A high index of suspicion should be held for aortic dissection in patients presenting with chest pain, especially as most Liberian doctors have never encountered this condition. Ultrasound is an ideal tool in low-resource settings, allowing the ability to diagnose conditions such as aortic dissection, which have previously been impossible to definitively diagnose; however, the expertise required to use it for aortic dissection is still limited to a small number of people in the whole country, so expansion of ultrasound training programmes is needed. Adequate access to CT scanners, radiologists, anaesthetists and cardiothoracic surgery capabilities are needed in Liberia. Leaving the country for necessary healthcare remains a viable option for only a tiny proportion of the population, with huge inequality in health outcomes linked with inequality in socioeconomic status. No matter how unattainable it may seem, the gold standard for diagnosis and treatment should always be offered to patients; it is unclear what resources are available to patients and miracles do happen. The authors would like to acknowledge Dr Philip Ireland’s valuable contribution in the clinical care of the patient, Dr John Ssentamu and Professor Joseph Njoh for their supervision of the Internal Medicine Department at JFK, and the LCPS and their international partners for their ongoing work in health systems strengthening in Liberia. WHO. ANNEX B Tables of health statistics by country, WHO region and globally. 2018 http://www.who.int/gho/publications/world_health_statistics/2017/EN_WHS2017_AnnexB.pdf?ua=1 (Cited 16 Aug 2018). Heart and Stroke Association Statistics. 1998 http://www.heart.org/HEARTORG/General/Heart-and-Stroke-Association-Statistics_UCM_319064_SubHomePage.jsp (Cited 16 Aug 2018).
. The challenges facing the management of arterial aneurysm in UNTH, Enugu. Niger J Med 2012;21:438–40.
. A study of extracranial aneurysms at UNTH in Enugu, Nigeria. Niger J Clin Pract 2010;13:272–5. WHO. Global Health Observatory country views. 2018 http://apps.who.int/gho/data/node.country.country-LBR (Cited 02 Jan 2019). World Development Indicators I DataBank. Liberia statistics summary (2002 - present). 2018 http://databank.worldbank.org/data/reports.aspx?source=2&country=LBR (Cited 16 Aug 2018). Contributors CPS was responsible for conception and design of the report and the editing of the final draft; EE contributed to the global health problem analysis; SG contributed to the global health problem analysis and the editing and approval of the final draft; and MAA was responsible for the editing and approval of the final draft.